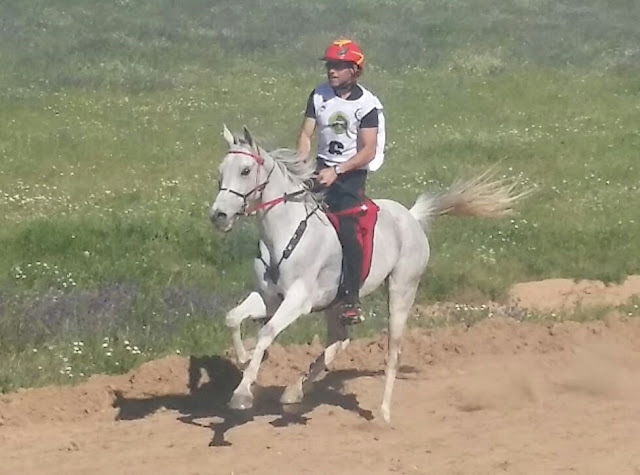 Alex Luque, riding the 8-year-old Abha Quely, won the 160-km Spanish Championship on April 30 near Badajoz, Spain. The pair finished with a time of 7:50.01, 13 minutes ahead of second place Angel Soy aboard Toumai Eureka. Maria Alvarez and Zefira finished in 3rd, 1 second behind Soy. Toumani Eureka won the Best Condition award. Eight of 31 starters completed the ride. 25 April, 2016, Fronteira, Portugal~ Laia Soria Pinol riding Kz Magica won the HH Sheikh Mansoor Bin Zayed Al Nahyan Global Arabian Horse Flat Racing Festival-sponsored 120-km National Championship ride of Portugal held in Fronteira on Saturday, 23 April 2016. A Facebook group, "Fair Endurance," for "Endurance riders, horses, trainers and owners of the horses," has created a petition on Change.org. Countering the 6600-plus-signature petition that was started in February to remove the WEC from Dubai - which the FEI subsequently did - the Fair Endurance group, citing "FAIR PLAY FOR ATHLETES," initiated the petition to reinstate the 2016 FEI World Endurance Championship in Dubai as it was legally appointed by the FEI Bureau in December 2014. "Play sports, not politics!" On 7 April 2016 the Fédération Equestre Internationale (FEI - the International Federation for Equestrian Sports) suddenly cancels the 2016 World Endurance Championships in Dubai that was legally appointed in December 2014. Read official statement of the FEI Bureau. Two months ago the FEI and Emirates Equestrian Federation (EEF) made an agreement that established stricter conditions of all Endurance competitions in the UAE. Trying to punish UAE riders, indeed the FEI punished all riders from all the world that come to the UAE to start in Endurance competitions. SO FEI PLAYS POLITICS, NOT SPORTS! We ask all equestrian people to sign this petition, because that agreement between FEI and EEF should be voided as illegal. Any amendments to the FEI Endurance Rules must be approved by all the National Federations at FEI General Assembly, not by separate agreement between FEI and EEF. We hereby petition the FEI to revoke the unwarranted and prejudicial ‘Final Exams Maximum Pulse between 56 and 60 bpm within 10 and 15 minutes’. • These rules are not practical and affecting us as riders, negatively. • We are unable to compete in such unfair situations, without achieving the goal of successfully finishing the ride. • There is no level-playing field by implementing such stringent measures for the purpose of punishing any country or any region. • FEI published Endurance Rules to be followed in all international competitions, Article: 814.1.5.5: “At the Final Inspection, the Maximum Pulse shall be 64 bpm within 30 minutes”. Furthermore, we request the FEI to reinstate the FEI World Endurance Championships to take place from 10-17 December 2016 at the Dubai Equestrian Club (UAE). • Advancing the qualification dates and the event dates, will in turn put the pressure on riders and horses to qualify within such a short period. • This will not give enough time to qualify the riders & horses, which is not fair. • Training plans will have to be changed, based on the climatic conditions & track. • Deciding the venue, just two or three months prior to the event, will affect horses results and welfare of horses will be of high concern. • The terrain and climatic conditions will not be known until the 14 June 2016, for a high level championship happening in September/October 2016. • Planning the budget is more crucial and now it is too late and almost impossible to find the money to prepare all arrangements for a different venue, which is still not known yet. Kings Forest near Thetford, Norfolk was the setting for three days of competitive routes through the iconic woodland of ‘The Brecks’. This unique area covers 393 square miles – the UK’s largest lowland forest, with miles of tracks and paths making it an ideal setting for Endurance GB’s main class of the weekend – a CEI 3* 160km (100 miles) competition. This distance is the ultimate challenge to the Endurance rider and four combinations rode up to the start line last Saturday morning in the dark at 5.00 am, head torches at the ready. The route comprised 6 loops, all coming back to the venue at Wordwell for strict veterinary checks and controlled rest breaks. 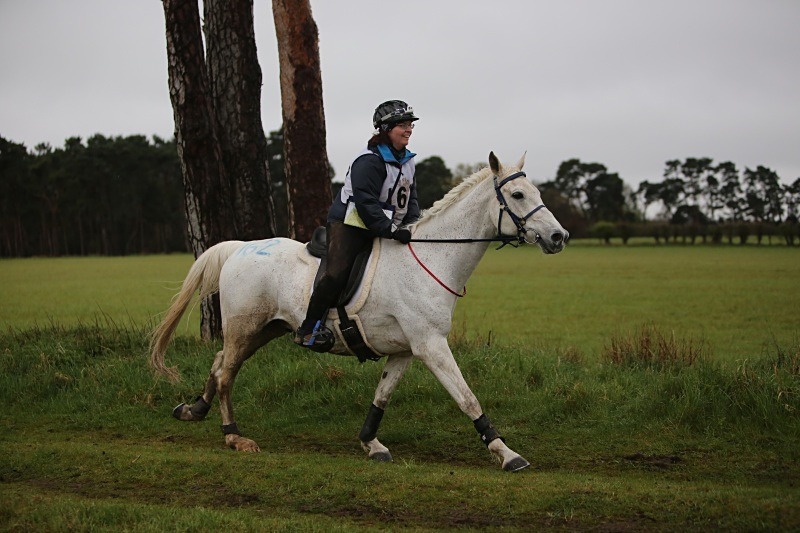 The weather proved the biggest challenge on the day with a cold wind and persistent rain, with occasional hail, making the going slippery in places and special attention needed to stop horses and riders getting cold at rest points. Two horses were stopped during the day by the vets due to minor lameness. The remaining two combinations went out together on the final loop with darkness descending. A strong bond develops between riders at this level of competition. 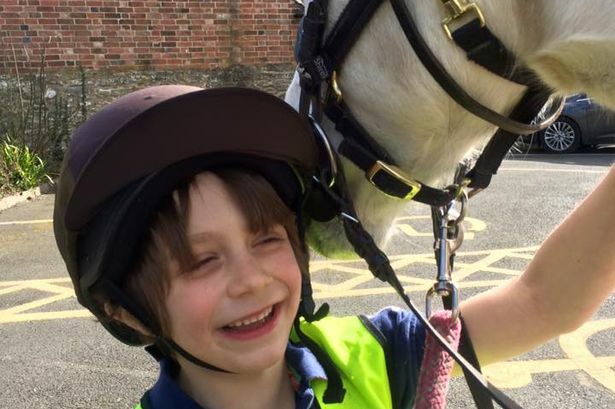 Riders work together to motivate each other and their horses. Fiona Griffiths from Powys, South Wales, riding Oliver Twist IV and Mel Bradley from Devizes, Wiltshire, riding 15 year old CS Khan, owned by Linda Cross, left the venue knowing that they were running close to the maximum time allowed. A small crowd gathered at the finish line waiting for news from the course. Word came in that they were approaching the finish line and a cheer went up. Mel and ‘Khan’ came into view with only minutes to spare, urged on by their crew. They dug deep and cantered brightly to the finish with just 22 seconds remaining on the clock. Fiona felt that ‘Oli’ was tired and decided to slow down on the last loop so finished some time later but to equal cheers from the waiting group. Both horses passed the final vetting in good form but sadly no completion for Fiona due to being out of time. The other FEI classes yielded a good completion rate, with many happy riders achieving their qualification goals. The weekend also had a full schedule of supporting classes at every distance demonstrating that Endurance really is a sport for everyone. The event was sponsored by Bury St Edmunds based, Science Supplements – leading suppliers of equine supplements, with welcome ‘goody bags’ and prizes galore. The riders and officials also benefited from a heated marquee generously provided by local FEI rider, Nicki Thorne and her husband, businessman Andy Thorne of Kestrel Liner Agencies. The photo is of Mel Bradley riding Linda Cross’s CS Khan to win the CEI 3* 160km event. Photo credit: Saunders Photography. A LOVE of horses has opened many doors for Kelsey Irvine. 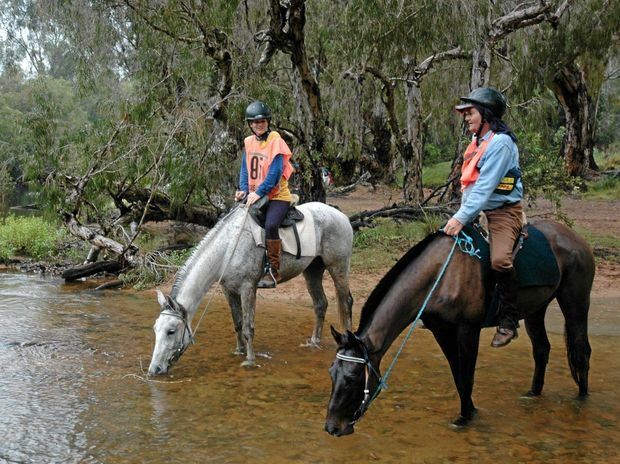 The 25-year-old elite endurance rider and horse trainer has been a polo groom at Kerry Packer’s property in the Hunter Valley, trained Arabian horses in Dubai and ridden the Canadian Rockies as a horseback tour guide. She also worked at stables in Eumundi and Kenilworth, for champion endurance rider Brook Sample. Between horsing around, Ms Irvine has worked the Victorian ski fields and travelled throughout Canada and America in an old blue Chevy with older sister Jess. It’s a long way from her family’s 162-hectare farm in Central Queensland but in an industry where pedigree counts for everything, hers provides a clue to the reason for her success. A press release from the office of Alan Winde, Minister of Economic Opportunities, dated 13 April 2016 stated that vets in the Western Cape have moved swiftly to contain the spread of African Horse Sickness in a bid to protect the province’s multi-million rand horse export industry. Last Friday, 8 April 2016, an African Horse Sickness related death was confirmed in the Western Cape and movement restrictions implemented. Cape Town - Thousands of Western Cape horse owners have been told to lock up their horses, with an indefinite quarantine announced in the province to prevent a deadly horse disease from spreading. Alan Winde, Economic Opportunities MEC, said on Friday the quarantine had been instituted after a Paarl veterinarian detected a case of African Horse Sickness (AHS) in a horse this week. “Samples collected from the colt tested positive for the AHS virus,” said Winde. Movement restrictions were in place and no movement of horses was allowed into the containment zone “without a movement permit from a state vet”. The quarantine is in place for a 50km radius around Paarl, and has led to the cancellation of various horse-related events planned for the weekend. KUALA TERENGGANU, April 11 (Bernama) -- "Beautiful State, Beautiful Culture" the tagline used by Terengganu for 27 years now, remains relevant in the promotion of tourism locally and internationally. Though the tagline will continue to be used, the tourism industry in Terengganu will be boosted by the inclusion of various activities and programmes to cater for tourists. Terengganu Menteri Besar Datuk Seri Ahmad Razif Abdul Rahman said the state was well known among local tourists as a leading popular holiday destination with pristine beaches, islands, batik and handicraft. However, Terengganu's position internationally as a tourism destination need to be given additional focus, especially sports tourism, as a new attraction to stimulate the tourism industry. "The weather and geographical positioning of Terengganu have been the state's two main setbacks although hosting the Monsoon Cup had given a new impetus to the tourism industry during the monsoon season. "But we did not see a strong impact from the Monsoon Cup towards the people of the state in general, so we are looking at other avenues, including endurance sports as an attraction. The Emirates Equestrian Federation will undoubtedly be distressed that its plans to host the World Endurance Championships in Dubai this December have been scuppered by the FEI Bureau. The bureau, meeting in Switzerland this week, decided that the United Arabs Emirates (UAE) still had welfare concerns in endurance that needed to be resolved before it could host the event. Stripping a world championships from a nation in such circumstances is a pretty big deal, and I don’t doubt that the Emirates Equestrian Federation will be smarting from the news for some time. At the FEI in-person Bureau meeting in Lausanne, Switzerland on April 7, 2016, the FEI made a key decision regarding endurance and the UAE. The FEI Bureau acknowledged the efforts that have been made by the United Arab Emirates National Federation (UAE NF) in Endurance since the reinstatement of the National Federation in July 2015. However, despite the hard work and progress to date, the FEI Bureau is of the opinion that the UAE NF is not currently in a position to guarantee that horse welfare would be fully protected at an FEI World Endurance Championship in the UAE this year. As a result, the Bureau decided to remove the FEI World Endurance Championships 2016 from the UAE. The Championships, which were scheduled to take place from 10-17 December 2016 at the Dubai International Equestrian Centre (DEC), were originally allocated to the EEF by the Bureau in December 2014. The bid process will now be reopened to find a replacement venue outside the UAE for the Championships. The deadline for receipt of bids is 18 May and the allocation to a new host will be made during the Bureau teleconference on 14 June. It is expected that the Championships will now take place in September or October, so the qualifying period will be moved back by two months and results starting from October 2014, instead of December 2015, will now count for qualification. At the same time, there was also unanimous agreement among the Bureau Members that rule breaches are absolutely unacceptable and that the FEI must work even more closely with the UAE NF to guarantee the National Federation’s full implementation of FEI Rules and Regulations as well as on the July 2015 agreement which will guarantee the welfare of the horse in National and International events. Additionally, and until further notice, the FEI will not sanction any events organised by the DEC.
Dubai International Endurance City hosts big event that brings the curtains down on Dubai’s endurance season – Dubai Crown Prince Endurance Cup. As you may know, during last month there were some tensions between FEI (Fédération Equestre Internationale) and EEF (Emirates Equestrian Federation). After the juniors and young riders 120 km ride that was held in Al Wathba, Abu Dhabi on 30 January, where “gross offenses” have occurred, FEI suspended remaining CEI rides in UAE until EEF to set an agreement on the proposed measures, with the caveat that no further events would be held in the region until agreement on these measures had been reached. So, FEI decided to punish UAE riders by doing this. On 13 February FEI and EEF were set this agreement that contains twelve approved measures, which will be applied for the rest of the UAE Endurance season. Again, these restrictions were set to slow down UAE riders. But overseas riders and horses, that arrived to UAE just a week before the date of start, are never raced with such fast speeds. Long flight from Europe, America and other continents to UAE, sharp change of climate and very hot temperature are the great stress for overseas horses. Their goal are not to race with a speed of 30-35 km/h, their goal are just to successfully finish in competing against the new terrain, hot temperature and unusual climate without having an enough time for acclimatization.